How ironic, this past week, while going through and sorting some digital photos my dad saved, I saw that he also scanned this very same newspaper. Evidently my dad also found the local news from 1904 interesting and scanned several items before he and my mom stored the newspaper away. It must be a family thing! Bo-Peep Items, 1904 Willshire Herald. The roads are better at present. Wm. Tinkham was collecting money for the quarterage last week. Frank Sipe has put up a picket fence within the last month. 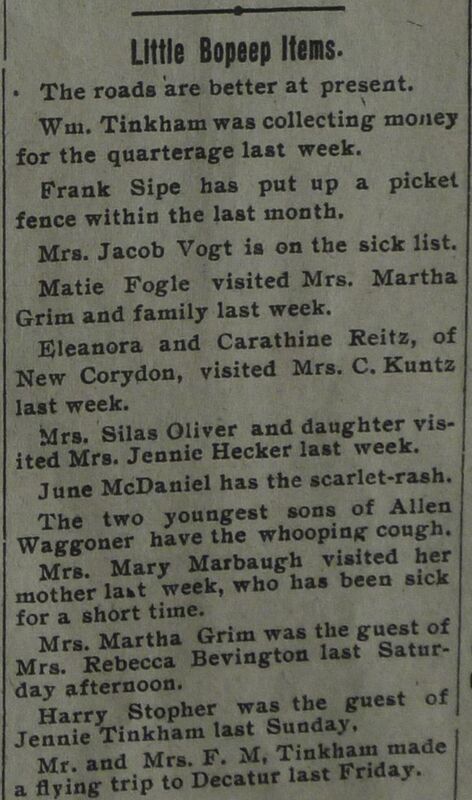 Mrs. Jacob Vogt is on the sick list. Matie Fogle visited Mrs. Martha Grim and family last week. Eleanora and Catharine Reitz, of New Corydon, visited Mrs. C. Kuntz last week. Mrs. Silas Oliver and daughter visited Mrs. Jennie Hecker last week. June McDaniel has the scarlet-rash. The two youngest sons of Allen Waggoner have the whooping cough. 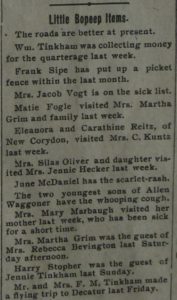 Mrs. Mary Marbaugh visited her mother last week, who has been sick for a short time. Mrs. Martha Grim was the guest of Mrs. Rebecca Bevington last Saturday afternoon. Harry Stopher was the guest of Jennie Tinkham last Sunday. Mrs. and Mrs. F.M. Tinkham made a flying trip to Decatur last Friday. I am not exactly sure where Willshire Center was. Perhaps a reader knows. F.G. Roehm and J.C. Schumm were Willshire business visitors Wednesday. Mrs. Wm. Buechner visited her sister, Mrs. F.G. Roehm, Wednesday. W.A. Carter, of Pleasant Mills, was seen in our neighborhood last Wednesday. C. Ault is teaching the spring term of school at Willshire Center. J.S. Schumm is putting down a new dry well on his place and will erect a new windmill and put in a pump. Mrs. John Roehm, Mrs. Fred Schinnerer, and Mrs. John Buechner spent Sunday afternoon very pleasantly with Mr. and Mrs. F.G. Roehm. Will this winter ever end and summer come? Old Mr. Lizar, of near Steele, is lying at death’s door with consumption. Henry Durrs visited John P. Hillyard’s last Sunday. John Hoblet and family were calling on friends in this community last Sabbath. R.O. Elston was at Berne Sunday. Mr. and Mrs. James Gause were at Van Wert last Wednesday, for the purpose of procuring a marriage license for Mr. Loop and Parmelia King. They also brought home with them some of the very dainty refreshments served at the wedding dinner. A grand birthday dinner was served at the home of Grandpa and Grandma Dull, two and one-half miles north of Willshire, last Sunday, May 1st, in honor of the 87th birthday of Mr. Dull. Those present and partaking of the splendid dinner and having an enjoyable time were their children, grand-children and great-grand-children, as follows: U.S. Dull, wife and child; A.W. Dull, wife and two children; S.R. Dull, D.L. Spahr, Miss Maude Spahr, C.M. Spahr, Will Myers and wife, Mrs. O. Swoveland and child; Dorcie Morehead and wife; Charles Dull, Bessie Bell, Samuel Slater, Marion and Flossie Baxter and Albert Case. Whereas: God in his wise providence has seen fit to remove from our Sunday school little Ruth Krick, we deeply mourn our loss yet our loss is Heaven’s gain. Be it resolved, that we extend our deepest sympathy to the bereaved family and that these resolutions be spread upon the minutes of the Sunday school and a copy presented to the family and one to the Willshire Herald for publication. Committee. Maybe you could acquire more old issues of the Willshire Herald and continue this series a little longer. I have really enjoyed reading about the daily activities in Willshire. I particularly enjoy Mr. Hoffer’s colorful writing. Makes you long for the simpler life when a Sunday afternoon visit to your neighbor was newsworthy. I agree both with your assessment of old time Sundays and the continuation of the series. Joe summarized it very well. Thanks for writing! We will just have to try to find some more old issues, then. Roadtrip! I, too, remember when Sunday afternoons were spent visiting. The good old days… Glad you enjoy reading through this old paper!